Learning SolidWorks Surfacing is a must in this competitive work environment. Helping you becoming an expert in SolidWorks in this surfacing intensive our mission. 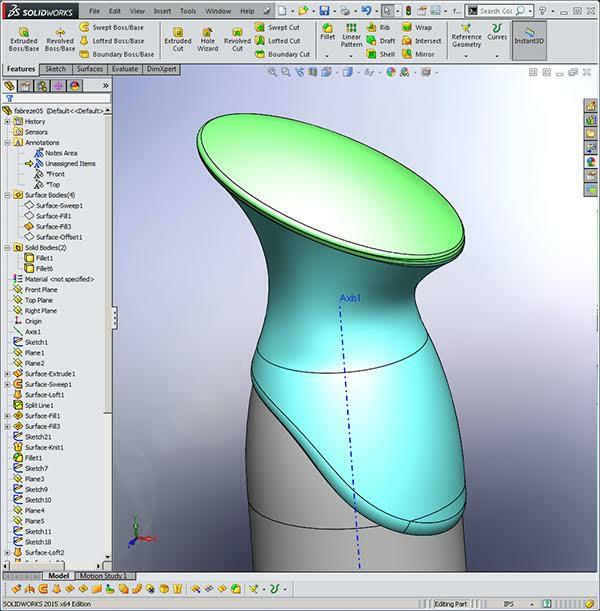 This one week intensive is a workshop that covers all the basics to advanced constraint based SolidWorks surface modeling training. Learn surfacing with respect to ergonomics, plastics, and with respect to how light reflects off of forms. Engineers learn to work with industrial designers while industrial designers learn how to encourage engineers to understand form, with respect to light reflections. Plastics Part Design, Die Cast Part Design, Mold Design for Plastic Injection. Manufacturing Week long Intensive, Plastics Part Design, Die Cast Part Design, Mold Design for Plastic Injection. Rhino or Alias Studio IGES and STEP import diagnostics. Manage Draft on complex Sweeps. Intersect Curves, projection curves, composite curve, split line curves. explore various curves such as style curves and compare to regular splines & 3d splines. Alias And Rhino modeling techniques and comparisons of using a parent child constrains modeler. 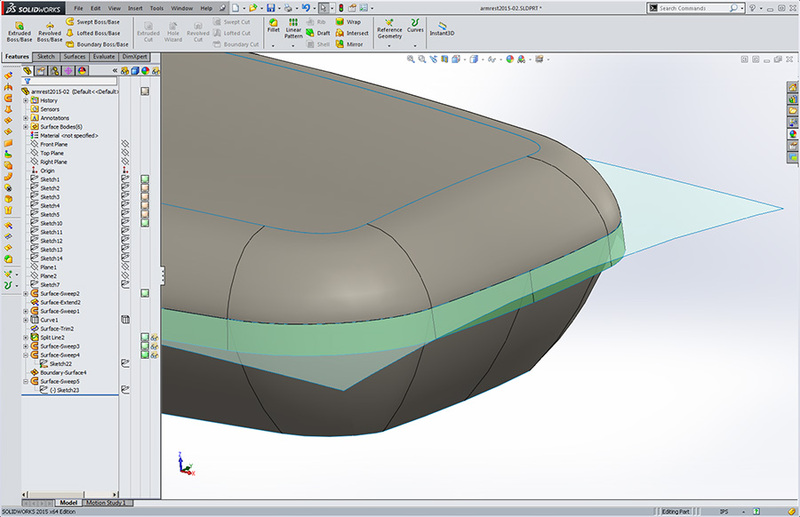 Use Mid-Surfaces as a technique used with top down design along with several top down design techniques available in SolidWorks. Learn to gain better light reflections and more control over your model. Learn to creating draft with parting surfaces. Learn to manage sweeps with respect to the pull direction of the part for better plastic parts. Discuss techniques with respect to better managing 2D and 3D IGES geometry. Utilize bounding box geometry to manipulate and change geometry rapidly with out failures. Discuss overbuilding with respect to tools and functions inside SolidWorks. Discuss a plan of attack, thinkmaps with modern day surfacing technique. Manage over-molding or co-injection with respect to tools we learned in the class. 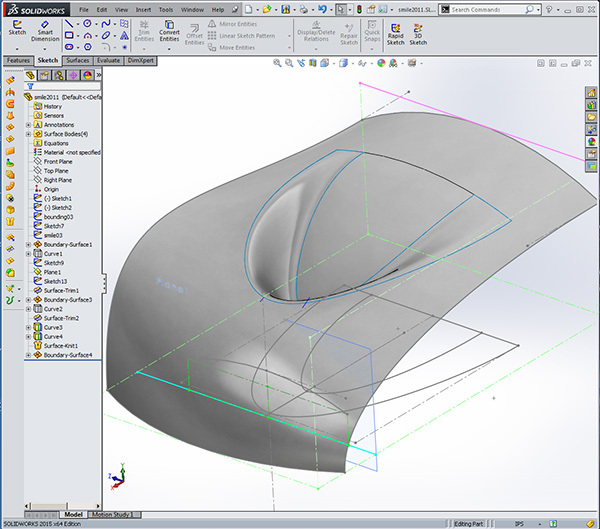 Utilize freeform to accomplish the same form with out an internal curve structure. Discuss G1/G2 continuity and light reflection with respect to product design and SOLIDWORKS surfacing in great detail. Discuss proving form by taking advantage of parent child relationships and maximizing equations in sketches and features. Discuss with examples top down design using SolidWorks and surfacing. Proctor & Gamble Febreze model created with SolidWorks Surfacing. Introduction to constraint based surfacing modeling using curves and surfaces & making changes utilizing the latest release of SolidWorks. This SolidWorks surfacing training course is developed for new and seasoned users who want to become proficient learning SolidWorks surface modeling in just one week. We help you learn SolidWorks, not read to you from a book or exercise. In this course we help design engineers or industrial designers learn how to make changes to models quickly ultimately to set them up for becoming expert faster. As with all Design-Engine classes, participants keep the training material login and password for life.